During the Hasbro Q1 Earnings Call, some small details came out about upcoming releases. Our good buddy NIBMRatchet from sister site TFW2005.com shared those details with us. 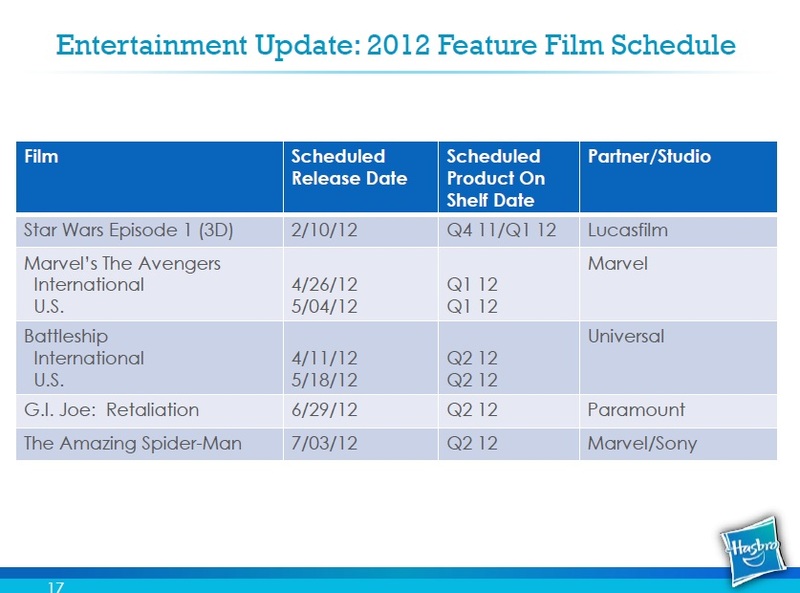 The Boys category will benefit from the launch of four major motion pictures in the coming months to global audiences. In partnership with Universal, BATTLESHIP is off to a great early start. The film recently launched in more than 50 international territories and while we are still awaiting final numbers, we are very pleased that in just 12 days, the film has grossed more than $100M in international box office revenue. MARVEL has two tremendous films this year – THE AVENGERS, from Marvel, opens May 4, and THE AMAZING SPIDER-MAN from Marvel and Sony, opens July 3. Both brands are being supported with television animation and we have strong lines for both properties. Finally, in partnership with Paramount, we are excited for the return of G.I. JOE to the big screen in G.I. Joe: Retaliation, coming to theatres on June 29th. 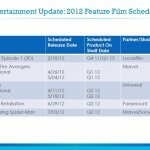 Click the thumbnail to see the official release times scheduled for toys like Spider-Man, Battleship, Avengers and more. Discuss on the Toyark Forums› Views: 4397 › Credit: NIBMRatchet of the Toyark Forums! This may not be a big news by now but I guess I'll mention it anyway. "The Boys category will benefit from the launch of four major motion pictures in the coming months to global audiences. In partnership with Universal, BATTLESHIP is off to a great early start. The film recently launched in more than 50 international territories and while we are still awaiting final numbers, we are very pleased that in just 12 days, the film has grossed more than $100M in international box office revenue. MARVEL has two tremendous films this year � THE AVENGERS, from Marvel, opens May 4, and THE AMAZING SPIDER-MAN from Marvel and Sony, opens July 3. Both brands are being supported with television animation and we have strong lines for both properties. Finally, in partnership with Paramount, we are excited for the return of G.I. JOE to the big screen in G.I. Joe: Retaliation, coming to theatres on June 29th." Thanks for looking out for us. I know they throw a lot out there in those calls. This one was the most boring of all. Thankfully it was over within 1 and a half hour. Dang this will def. affect the MU figures from being released than. With this many goodies coming out soon. The only new information in there, Marvel-wise is that the Amazing Spider-Man toys will hit shelves somewhere between April 1st and July 30th. Thanks for doing the work. I just wish they could be more transparent. Yeah, and that's pretty much a given anyway, honestly thought we'd know the actual release date and it would be soon since the Avengers line hit a little over two months before film release and that's about how far we are from ASM now.